This Bach Flower Essence relates to the soul quality of self-confidence. The negative state usually stems from infancy, or even before birth, when the child takes on it's parent's negative attitude. This person doesn't doubt his abilities, he knows that he is inferior and "can't do it." As a result, he fails to learn and grow and change through new experiences. The personality becomes impoverished and life becomes mired in feelings of discouragement and an unconscious melancholy. This Bach Flower Essence has shown itself to be useful when an extra dose of self-confidence is needed - as when facing examinations or enduring divorce proceedings. It is indicated for use in children who are afraid to venture on their own, but always want mom or dad or an older sibling to "go first." 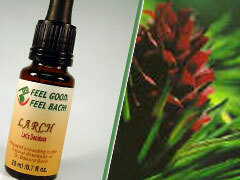 Larch is used in the treatment of alcoholics who drink to "forget their failures" and in problems with sexual potency which stem from the belief in and expectation of the re-occurrence of the problem.